This article written by me for the September, 2001 issue of the Kymer Clarion. 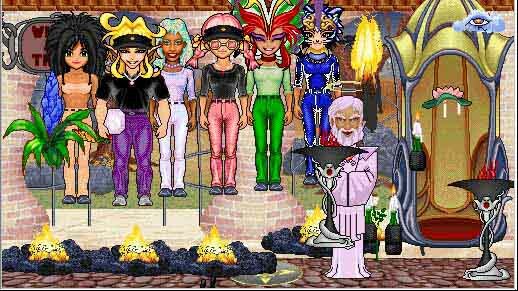 The Clarion, an online newspaper, has been covering the news and events of a virtual world known first as WorldsAway and then VZones since 1995. I believe that preservation of historical documents in the digital age is, and will increasingly be, a major problem. So, I present to you this article completely untouched, as it was written in 2001, poor English and all. Hello everyone. Being a LONG time reader of the Clarion, I thought a great way to support its relaunch would be to write for it! I feel like I need to perhaps introduce myself and this bit of writing I'm doing. My name is Lord Xopl. Some of you may know me as Kymer's very own pumpkin. 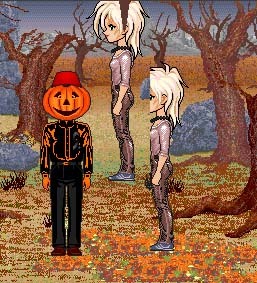 I was Argo cargo way back in March of 1996, and yes, I've really been a pumpkin all this time. Nope, it isn't just a Halloween costume. If you've never met me, I encourage you to say hello. Walking googah, caught on film! Not much more to say about this. This is a first for me, and definitely strange! Here we find a bunch of kind hearted avatars both beautifying Kymer and offering some goodies to the citizens. It is great to see stuff like this. Kymer has a long history of generosity, and here is a perfect recent example of people putting kindness above pixel wealth. When I was just a newbie, I was on the receiving end of great acts of generousity and kindness, and they only thanks they ever asked for was that I return the favor to others when they are new. It is a great philosophy to adopt, and it is certainly at our community's roots. Ah yes, the opening of the Blasted Heath. There is just so much I could say about this! The Heath has been a bit of a mystery for us since the beginning of time! It is interestingly one of the last pieces of realistate that was left to be opened. It has sat on the much less traveled Oak Street side of town for 6 years, with its dark and mysterious ambiance. I saw the effects of Carmilla coming out of the Heath, and I watched Teresias go into the Heath. I imagined the opening of many areas in Kymer, but I must admit I never thought I'd see the Heath open as soon as it did. It was always rumor that the Magic Shop and Heath would open in conjunction with eachother. It was thought the Heath would be a gaming area and the Magic Shop would be the supply station. Gaming area? Yes! Did you ever notice that 'How healthy am I?' option on your avatar? Well perhaps after visiting the Heath you wouldn't look so fabulous. Well, needless to say, that isn't the case. However, there is the unopened tomb? Could it be? One thing requiring attention here is my two photos. Notice how we have floating avatars and a much sunken Necrolyte White Rose? Notice the various floating items? Well, it should be noted that never before have we seen such oddities during the opening of an area! When our world was cared for by Oracles, you did not see items move via unseen spirits. You did not see avatars' heads suddenly spin to the side. Indeed it was fascinating to watch the spirits of the Heath have such an outstanding visible effect on item and avatar alike. Perhaps we never saw such displays before because never has such a spirit filled area opened? Or perhaps we never saw such things before because the Oracles held different opinions on what kinds of events we should see transpire? I can't say I didn't like seeing the spirits of the Heath's great effects, but it was indeed different for me. These pictures are from after the Heath opened. Domino and I discovered the message 'neysa' scrawled out on the floor by the hidden fountain. I still don't know if this was supposed to mean anything? At any rate, soon after this we were walking through the Heath maze trying to find any other perhaps secret solutions. Our breadcrumbs (read: tokens) came in very handy, and we didn't find any hidden paths to the inner mountain. I did manage to capture that odd photo of Domino, though. Oh, and what is the deal with the computer head holding onto that bizarre item? Well that happens to be SubTLE (with a bit of Mel to the side there). These two both happen to possess bits of the Heath sign which they snagged just as a CT was trying to destroy them. Mel tells me her's ID's as torch, but it certainly doesn't look like a torch. Why they turned into these odd brown chunks, I do not know. I've never seen anything like it. I never heard of anybody snagging anything from an Oracle before the Oracle could delete it. Well it was fern day, again. This one went on without a hitch, much unlike my first Fern Day in 1996. Our world was crashed almost the entire day for Fern Day 96. We like to call it Crash Day and the day after Fern Day. I suppose quite a few of you may not be familiar with the fact that ferns used to be somewhat of a treat, and we only had the one variety (the medium fern this year is the original form). Before Crash Day 96 ferns were fairly uncommon, fetching around 1600 tokens on the street. 1600 was not chump change at the time, either! This was before ATM hacks, before token scandals, before tokens being sold on avatarwares, and we paid by the HOUR... so no parking!!! Well, I suppose I should explain that picture I've shown you all above. 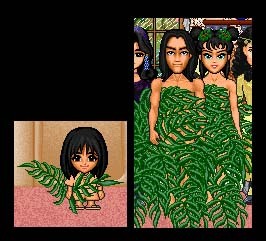 You've got the Stardusts and I think lil' Pureangel all hiding their shame behind a fern in a lovely Fern Day kind of way. The wee one is awfully cute with that wee little fern! I mean, don't get me wrong, it is absolutely fantastic that we saw some real newbies this month (go new billing system! ), but WHY is their head BROKEN? Every time I entered a locale with one of these newbie heads, I'd get the message you see about having one new image to download with a size of over 2,000,000,000 bytes!!! TWO GIGABYTES! Needless to say I didn't actually download a new two gigabyte graphic, this is a bug. And nope, it wasn't just me. I verified this with others. And I did in fact narrow it down to this new newbie head. Pretty weird stuff. 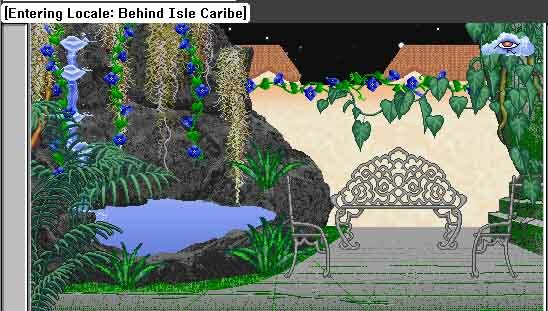 After reading about Kradelcaro and Thgilelcaro in the Virtual Planet I decided to go check out the new night sky behind Isle Caribe. Much to my dismay however, and probably much to the dismay of Kradelcaro, Thgilelcaro, there were NO torches or lamps left to light the way for the "missing third being." The way I see it, those lights ought to help this being become unlost AND also bring it to the very locale where Kradelcaro and Thgilelcaro hoped to find it. I set some torches out, but they were gone in a matter of minutes. Honestly now, who picks up a couple of torches they see laying on the ground? Just leave the torches alone folks. Well, this about wraps it up. Other events to note for this month were me almost being eaten by a horde of cobras, the first reports of theives I've heard in ages (careful out there), attack of the monkee head, newbies (yay! ), 110% pawns (just ask me), Turtle Tag, and some new froot. There is one more thing I'd like to plug here. I like to get a Conversation Club going. I'd like to set a day, time, and place each week where avatars can meet up to enjoy some good oldfashioned chatting. I'd like to think this will attract some people back into our city and perhaps even reintroduce people to one another. This all comes from a conversation with Marianne G and my desire for an Old Timer's Club. I certainly wish to get some Old Timer's to attend these Chat Hours, but I wouldn't ever turn ANYONE away who wants to get down to some talking! Any oldbies reading this: I think you'd be surprised just how many of your old friends still have their avatars! This is a great way to rediscover your old friends! To any newbies and inbetweenbies: I'd love to get to know you and show you that our community is about friends, talking, and fun!